As I struggle to archive and organize my own history, I'm often frustrated by my past self's inconsistent note-taking. 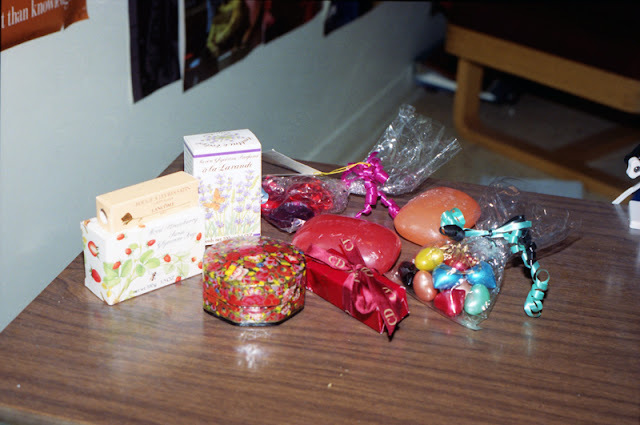 Why did he take this photo of assorted gift soaps? I recognize the setting, thanks to the posters in the background and the shape of the furniture; it's my old room at Lister Hall, on the University of Alberta campus. But that's all I know. Were the soaps a gift? Was I the recipient, or the giver? Why were they significant enough to photograph? I use whichever soap is cheapest - a bar of Irish Spring or whatever. Did I buy these soaps? Was it a Secret Santa gag gone wrong? Was I hoping to woo some fellow student with a gift of decorative soaps? Why did I shoot these Lister soaps? Did they embody all my hopes?